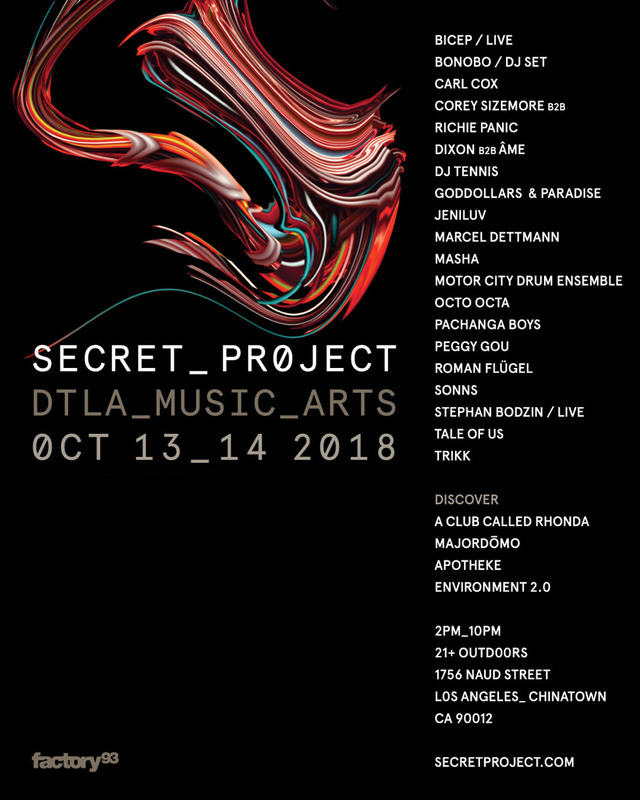 Secret Project Comes To Chinatown Los Angeles October 13rd and 14th ~ Soundtracked by Carl Cox Ame b2b Dixon, Tale of Us, Stephan Bodzin (live) Bicep (live), DJ Tennis, Pachanga Boys, Peggy Gou, Roman Flügel, & More - Track? !D. Secret Project arrives in Los Angeles in mid-October, immersing itself in the creative community surrounding Chinatown’s Naud Street to present a pioneering two-day block party. Secret Project will partner will local businesses like David Chang’s Majordōmo, the beloved bar Apotheke and LA’s Club Called Rhonda to create bespoke quintessentially LA experiences on-site, as well as street walls and projects from local artists. Secret Project emerges from a neighborhood that has quietly, over the last few years, become one of the most exciting in Los Angeles. Hidden between the Gold Line, the renovated Historic State Park and the LA River, Chinatown’s Naud Street neighborhood has added world class restaurants, art galleries and events, a wealth of street art walls, uniquely creative businesses and cutting edge musical projects from Factory 93. Secret Project will be soundtracked by the worlds best left-of-center DJs and live acts. It is a first of its kind festival in LA, dedicated to presenting the avant-garde, indie leaning and esoteric strains of electronic music, in a unique outdoor daytime setting. Secret Project will house two main stages in the industrial core of Chinatown - an incredible location for a genre of music that has often been associated with urban centers like Berlin and Detroit. In line with events like Movement and Sonar, Secret Project will takeover venues throughout downtown LA for a range of after-parties with details and lineups soon to be announced. Attendees will have the option to purchase VIP access to experience the world renowned cuisine of David Chang and dine at his Majordōmo restaurant, which Eater called ‘the most exciting restaurant to open in America in 2018’ and has earned top nods from GQ, The New Yorker, LA Magazine and more. While LA’s A Club Called Rhonda will bring their poly-sexual dance party to Apotheke, which has earned nationwide praise for its unique mixology program. Secret Project will bring in an array of art offerings to compliment Naud Street’s extensive murals. Secret Project is presented by Factory 93, who have a long-standing commitment to showcasing forward thinking music and culture at large-scale shows in Los Angeles, and uniquely programmed stages at some of the world’s best festivals. Factory 93 was a pioneer in this neighborhood, having produced events in the area since 2016. After an acclaimed headlining show at The Greek Theater this year and a Grammy nomination for his album ‘Migration’, Bonobo will perform alongside the Irish live duo Bicep. Both these artists, and the rapidly rising Korean producer and DJ Peggy Gou, are associated with electronica label Ninja Tune, who opened up their LA office five years ago. They’ll be joined by Life and Death’s Tale of Us and DJ Tennis, who alongside Innervisions’ Dixon, Âme, and Trikk and Burning Man icons Pachanga Boys, will present their dramatic and melodic take on house music. Berlin’s legendary techno institution Berghain will be represented by Marcel Dettmann, who’ll be joined by live analog German techno wizard Stephan Bodzin, while veteran selector Roman Flugel will explore the the deeper shades of German house and Motor City Drum Ensemble spins his singular, contemporary interpretation of disco. As a continuation of the event’s commitment to showcasing LA’s creative dance music community, Secret Project will welcome performances by some of the city’s most respected figureheads like founder of the much loved Dig Deeper event series and a broadcaster on NTS Radio, Masha, Making Shapes curator and selectors Jeniluv and Sonns, and Lights Down Low founder Corey Sizemore playing B2B with Richie Panic. Programming will be rounded out by one of the venerable statesman of techno, Carl Cox, an icon revered around the world for his unwavering commitment and enthusiasm for promoting underground dance music.